Mountain tourism is a considerable factor of development and prosperity throughout Europe. Mountainous regions in particular host many renowned tourist destinations, generating employment, economic activity and social integration, while contributing to the development of the local economy, services and infrastructures. At Euromontana, we want to show that if promoted in a sustainable way, tourism can even help to preserve natural and cultural heritage. Maximise the potential of EU financial policies and instruments for developing tourism. The European Union has acquired only recently competencies in the field of tourism, a sector largely under the responsibility of Member States. The EU has the responsibility for coordination, support and complementation of Member States’s actions (Article 6 of the Treaty on the Functioning the European Union) in this sector. Thus, significant opportunities remain in activities related to networking and exchange of good practices between tourism actors and European regions. Euromontana members are very sensitive to the touristic potential mountain regions have. To ensure that mountain tourism stakeholders take full advantage of new opportunities and meet best tourist’s demand, Euromontana addressed the theme of tourism within various events, studies and projects. Discover Euromontana’s position, elaborated in 2011 and how Euromontana foresees the future of European tourism (2014). Follow–up of activities at EU level. Euromontana closely follows and informs its members about the European policy development regarding tourism. Euromontana also supports and promotes sustainable tourism in the mountain areas through the exchange of good practices between members, participation and positioning in various events, seminars and public consultations held at European level. Euromontana has participated in several actions linked to the development of sustainable tourism. In 2012, the European Commission has launched a public consultation on a European Charter on sustainable and responsible tourism, to have a common definition of sustainable tourism. Euromontana has answered to this public consultation in April 2012, see here our answer. The final validation of this Charter is still pending. In 2012, the European Commission also launched a public consultation on the European Tourism Quality Label (ETQL), to create an umbrella label for quality schemes to increase consumer security and confidence in tourism products. Euromontana has answered to this public consultation in July 2012, see here our answer. In addition, DG Enterprise and Industry has implemented, in 2013, the European Tourism Indicators System (ETIS): for Sustainable Management at Destination Level: a set of 27 core and 40 optional indicators to evaluate and monitor the progress towards a more sustainable management of the touristic destinations. A first pilot phase on 100 destinations lasted from July 2013 till April 2014. A second pilot phase took place in 2014-2015. Over 100 destinations participated in this test phase. You can download the 2016 ETIS toolkit on this page. More generally, in 2014, the European Commission has launched a public consultation on the Future of European Tourism to identify the key challenges and opportunities for the European tourism industry’s future. Euromontana has answered to this public consultation in March 2014, see here our answer. In order to prepare the new programming period 2014-2020, Euromontana has listed the funding possibilities for tourism in mountain areas. See here the articles on “Funding Opportunities for 2014-2020” published in December 2013 (only for members). A background paper recalling the main players of the tourism industry at world level, the different definitions and key issues of sustainable tourism in mountain areas is available here. This document was distributed in September 2011 as a preparatory document of the conference “Sustainable Active Tourism – mountain communities leading Europe in finding innovative solutions” held in Inverness, Scotland. The study “European policies regarding sustainable mountain tourism” was carried out in 2010, in collaboration with Euromontana members and various tourism related stakeholders from 8 countries (Austria, Germany, France, Macedonia, Norway, Spain, Slovakia, Romania). in January 2009, at the request of the French Ministry of Agriculture, Euromontana carried out the study “Improving the attractiveness of rural areas through common strategies” which focused on collective initiatives in the field of culture and tourism in mountain areas (in French). 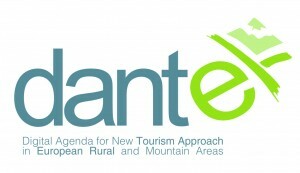 25 June 2014 | Euromontana organised a conference on “How to reinforce ICT and tourism strategies in rural & mountain areas? Tools and strategies“ on 25 June 2014 in Brussels in the context of the DANTE project. 27-28 September 2011 | In order to foster the capacity-building of tourism actors, we decided to devote our 2011 annual conference to the issue of sustainable active tourism. The conference “Sustainable active tourism – mountain communities leading Europe in finding innovative solutions” took place in Inverness, Scotland, from 27 to 28 September 2011. Following this event, a Euromontana position paper to support the development of sustainable mountain tourism initiatives in Europe was published. It can be found here. Develop a Sustainable Tourism Plan by local governments involved in order to transfer the good practices to be developed in their rural and mountain areas. Coordinated by the Province of Torino, the partnership comprises 15 partners from 12 European countries. For more information, please have a look on DANTE website and all on its results: the good practice book and the thematic guidelines.